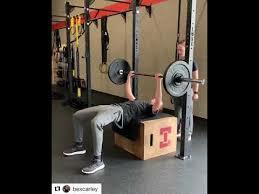 — I saw this exercise on @dr.joelseedman_ahp ‘s page and it drew my attention because my client Eric has a goal to bench press his body weight, but we aren’t quite there yet. Being able to horizontal press safely takes back and chest strength, along with stability throughout the shoulder. 1️⃣ The Box still provides the same aspect of the floor press being that the shoulders and back are in a packed and safe position. 2️⃣ I coach the floor press with a tight core and lower back pressed into the floor. The Box bench press maintains this aspect of neutral spine versus the excessive lumbar arch you often see when bench pressing. 3️⃣ The bench press is a full body exercise, being that the hips play a role in the concentric part of the lift. Standard floor press doesn’t allow for hip drive, and this exercise does. Thank you for this variation @dr.joelseedman_ahp ! Really excited to incorporate this!